You might have a great and undiscovered talent for raising chickens in your backyard. Making sure it’s legal to own chickens where you live is the first step in not making a big mistake. If legal, having your own little backyard flock can be a great idea, providing you with eggs or just the beauty and connection to nature that chickens can provide. Chickens can be beneficial to the backyard environment, providing fertilizer for plants and grasses. Chickens allowed to forage in the yard enjoy eating insects, spiders and can actually eat enough grass to make mowing a less frequent chore. Whatever your reasons for considering keeping chickens, making sure this is an activity you have the time and finances for is wise before bringing any chickens home to roost. Studying different breeds and feeds, coop plans and chicken yards, as well as pricing out a list of needed materials will help you count the cost of raising chickens in your backyard. As well as benefiting your yard, chickens can be destructive. Droppings can burn and kill grasses if too many chickens are allowed to roam the yard too often. Droppings contain high nitrogen levels that if not diluted and well distributed are toxic to plants. Chicken droppings left randomly on walk-ways, porches and steps may be tracked into the house creating an unpleasant environment for humans and any backyard pets. Droppings may contain organisms that if ingested, could spread parasites and intestinal disorders in other animals and humans, especially children. Chickens like to scratch through grasses for tender blades, bugs and seeds. They also like to dig up areas of dry soil for taking dust bathes, which can disturb plant roots and leave little dust bowls here and there, some 10” deep. Raising chickens in your backyard is not a decision to be taken lightly. Chickens are a 24/7 responsibility and expense. With feed prices on the rise you may find it hard to provide good quality feed at prices you originally expected. If chickens have been purchased on a whim as pets for adults or children, once the newness wears off, the chickens may suffer from lack of good care and daily enthusiastic attentions. As with any interests in life, often we don’t know until we get there and are in the middle of the activity, if it’s a natural and easy adventure or a burden. Starting out small is always best. Bantam chickens are small, don’t eat a lot and don’t need large housing. The hens can provide nice little eggs for your kitchen and can make good pets. Ready-made chicken houses, like chicken tractors, can be a good first step before building a more spacious coop and yard . To get started raising chickens in your backyard you might purchase a couple of adult bantam hens and see how things go. Need help building your next coop? I often get questions about building chicken coops. In order to best help you in this area I took the time to preview a couple coop plan resources. I encourage you to click here and discover my findings. 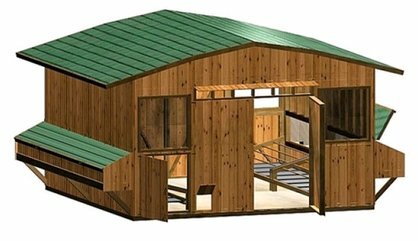 If you're looking for a quality set of chicken coop plans then take a look as I narrow it all down. I know everyone brags about their plans so I wanted to help simplify the process for you. If caring for chickens is a welcome activity you might consider raising some chicks the following year to increase your flock, after setting up a good brooder, coop and chicken yard. Always make sure you have more than enough room for the chickens you plan to keep. If space is limited keeping a small flock is best. Our website is designed to help you predict and prevent many of the problems some people encounter as they learn about raising chickens. We have a library of over 1000 questions from people like you that are curious about keeping chickens. With many years of keeping chickens, rescuing chickens, breeding chickens, raising chicks, and helping sick chickens, we have answered these questions concerning everything chicken based on what we have learned. We want raising chickens in your backyard to be a good experience. Hopefully we have provided everything you should know before getting started and after you get going. Just check out the complete list of topics in our sitemap. This article is designed to provide some pro’s and con’s you might not have considered before. We’re not trying to scare anyone that wants to join in an activity that we have come to love – Raising Chickens. In fact we welcome you into the flock of chicken loving people whether you decide to keep chickens or admire them from afar, whether it’s something you’re ready to do or think you might have time for once you retire. Raising chickens in your backyard can provide hours of enjoyment and rewarding labor every day or every week. As with many activities, the more you put into creating a healthy, happy and humane life for your flock, the more your rewards will be. Chickens are awesome creatures that continue to interest and surprise me, even after a couple of decades being devoted to their care. Much that I have learned about chickens comes directly from the chickens while studying their behaviors, habits and needs. The rest has come from people that share my love and respect for this diversely beautiful species. If you have found yourself with some chickens and aren’t enjoying the experience, if we can’t help make it better, please look for a good home for them. A local humane society or bird rescue may be able to help. Feed stores often have free bulletin boards for advertising and there are internet resources, too, including our Chickens for Sale and Auction pages.